Over 300 million tones of industrial wastes are being produced per annum by chemical and agricultural process in India. These materials pose problems of disposal and health hazards. The wastes like phosphogypsum, fluorogypsum and red mud contain obnoxious impurities which adversely affect the strength and other properties of building materials based on them. Out of several wastes being produced at present, the use of phosphogypsum, flurogypsum, lime sludge, hypo sludge, red mud, and mine tailing is of paramount significance to protect the environment. Paper making generally produces a large amount of solid waste. Paper fibers can be recycled only a limited number of times before they become too short or weak to make high quality paper. It means that the broken, low- quality paper fibers are separated out to become waste sludge. All the inks, dyes, coatings, pigments, staples and “stickies” (tape, plastic films, etc.) are also washed off the recycled fibers to join the waste solids. The shiny finish on glossy magazine-type paper is produced using a fine kaolin clay coating, which also becomes solid waste during recycling. This paper mill sludge consumes a large percentage of local landfill space for each and every year. Worse yet, some of the wastes are land spread on cropland as a disposal technique, raising concerns about trace contaminants building up in soil or running off into area lakes and streams. Some companies burn their sludge in incinerators, contributing to our serious air pollution problems. To reduce disposal and pollution problems emanating from these industrial wastes, it is most essential to develop profitable building materials from them. Keeping this in view, investigations were undertaken to produce low cast concrete by blending various ratios of cement with hypo sludge. This project is concerned with experimental investigation on strength of concrete and optimum percentage of the partial replacement by replacing cement via 10%, 20%, 30%, 40%, 50%, 60% and 70% of Hypo Sludge. Keywords: Hypo Sludge, Pozzolanic Property, supplementary cementitious materials. Technological improvement over the year has contributed immensely to the enhancement of quality of life through various new products and services. One such revolution was the pre engineered buildings. Through its origin can be traced back to 1960’s its potential has been felt only during the recent years. This was mainly due to the development in technology, which helped in computerizing the design and design. Although PEB systems are extensively used in industrial and many other non residential constructions world wide, it is relatively a new concept in India. These concepts were introduced to the Indian markets lately in the late 1990’s with the opening up of the economy and a number of multi nationals setting up their projects.The market potential of PEB’s is 1.2 million tones per annum. The current pre engineered steel building manufacturing capacity is 0.35 million tones per annum. The industry is growing at the compound rate of 25 to 30 %. Here is the project report of a civil engineering student who has spent 6 months on a training site.Due to security reasons,the project details, estimation, some portion of design and quantity calculations have been omitted.But to help the civil engineering students we had shown all the necessary works..
Site Clearance– The very first step is site clearance which involves removal of grass and vegetation along with any other objections which might be there in the site location. Demarcation of Site– The whole area on which construction is to be done is marked so as to identify the construction zone. In our project, a plot of 450*350 sq ft was chosen and the respective marking was done. Positioning of Central coordinate and layout– The centre point was marked with the help of a thread and plumb bob as per the grid drawing. With respect to this center point, all the other points of columns were to be decided so its exact position is very critical. Excavation was carried out both manually as well as mechanically. Normally 1-2 earth excavators (JCB’s) were used for excavating the soil. Adequate precautions are taken to see that the excavation operations do not damage the adjoining structures. 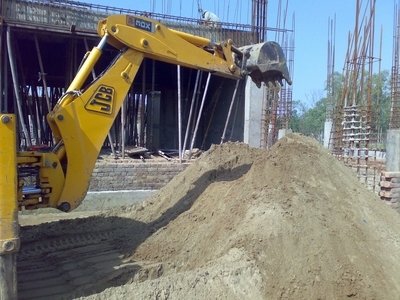 Excavation is carried out providing adequate side slopes and dressing of excavation bottom. The soil present beneath the surface was too clayey so it was dumped and was not used for back filling. The filling is done in layer not exceeding 20 cm layer and than its compacted. Depth of excavation was 5’4” from Ground Level. Concrete is a mixture of cement, sand, stone aggregates and water. A cage of steel rods used together with the concrete mix leads to the formation of Reinforced Cement Concrete popularly known as RCC. Fresh Concrete should be stable and should not segregate or bleed during transportation and placing when it is subjected to forces during handling operations of limited nature. The mix should be cohesive and mobile enough to be placed in the form around the reinforcement and should be able to cast into the required shape without loosing continuity or homogeneity under the available techniques of placing the concrete at a particular job. The mix should be amenable to proper and through compaction into a dense, compact concrete with minimum voids under the existing facilities of compaction at the site. A best mix from the point of view of campactibility should achieve a 99 percent elimination of the original voids present. The process of selecting suitable ingredients of concrete and determining their relative amounts with the objective of producing a concrete of the required, strength, durability, and workability as economically as possible, is termed the concrete mix design. The proportioning of ingredient of concrete is governed by the required performance of concrete in 2 states, namely the plastic and the hardened states. If the plastic concrete is not workable, it cannot be properly placed and compacted. The property of workability, therefore, becomes of vital importance. The compressive strength of hardened concrete which is generally considered to be an index of its other properties, depends upon many factors, e.g. quality and quantity of cement, water and aggregates; batching and mixing; placing, compaction and curing. The cost of concrete is made up of the cost of materials, plant and labour. The variations in the cost of materials arise from the fact that the cement is several times costly than the aggregate, thus the aim is to produce as lean a mix as possible. From technical point of view the rich mixes may lead to high shrinkage and cracking in the structural concrete, and to evolution of high heat of hydration in mass concrete which may cause cracking.